This elegant wedding set has rhinestone 'daisies' connected together to make a strong bridal statement. 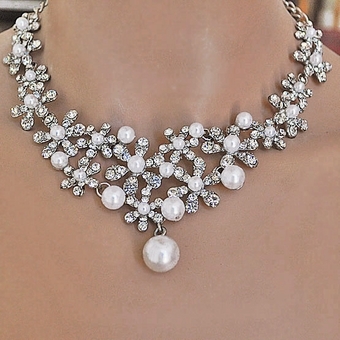 The necklace itself has a durable rhodium backing with genuine rhinestone and white faux pearls on an 18 inch adjustable chain. Matching earrings are 1-3/4 inches long.